Black garlic gives panache & excitement to almost any dish… soups, salads, veggies, rice, casseroles, meat dishes, even gluten-free toast! It is soft & spreadable. It is sweet and has a complex, savory flavor with hints of molasses and balsamic vinegar. No pungent garlicky taste or bitterness! Black garlic is very high in antioxidants. 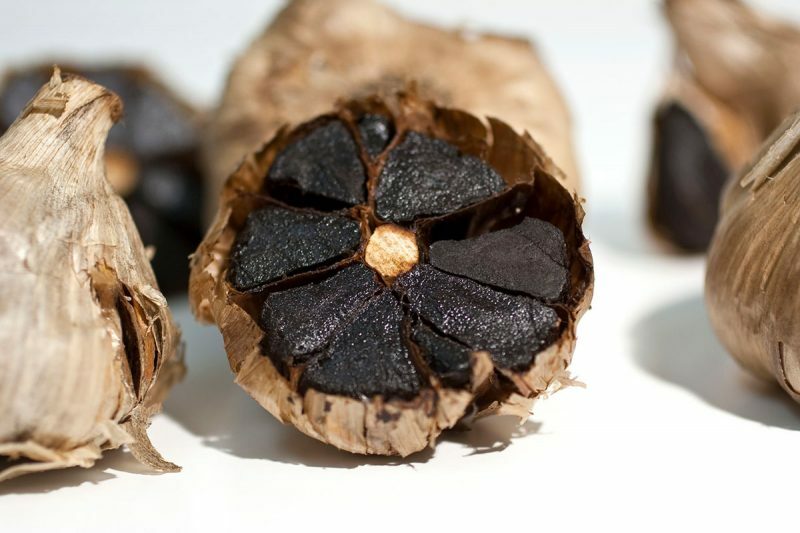 The health benefits of black garlic are being touted worldwide by natural medicine practitioners and herbalists. 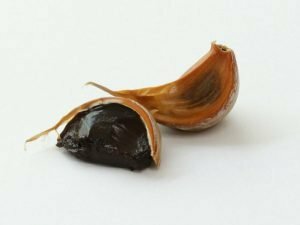 Black garlic has been called fermented garlic, but the process does not involve microbial infusion typical of sauerkraut, kombucha, and the like. Black garlic is quite easy to make, but if you would rather buy it, you can get it at blackgarlic.com.sg. Be sure to check first with your local grocery store, I get mine at our food co-op. 4 oz. jelly jar to keep the garlic from sitting in the juices produced by the incubation period. Dehydrator, any brand will do as long as you can put the ½ gallon Mason jar inside and maintain the temperature at 140º F. I use an Excalibur dehydrator. Place the 4 oz. jelly jar upside down inside the ½ gallon jar. Add as many garlic bulbs as you can fit into the jar. Be sure they are not sitting on the bottom of the jar because the juices collect at the bottom & the garlic will get soggy. Tighten the 2-piece canning lid to seal the jar. Place in the dehydrator. Set the dehydrator at 140º-145º degrees. Leave it for 40 days. After 40 days, check the garlic to see if it is black & does not have a garlicky taste. If you still detect garlic flavor, leave it in longer. I have left it in for 50 or more days until the desired flavor is achieved. Place as many jars of garlic in the dehydrator as you can fit inside. Alternatively, you could probably use any appliance that will maintain a temperature of 140º. The warm setting on a slow cooker typically is 165º. I have not tried using a slow cooker, but it’s worth a try. Once the garlic has incubated for 40-50 days, remove the lid from the mason jar, pour out the black liquid at the bottom, and test to see if the garlic is black and firm enough to easily remove a clove from its skin. If the clove is too mushy, return the bulb to the half gallon jar and leave in the dehydrator, without the lid, at 140º for a few more days to dry out. Check periodically to prevent the cloves from getting too hard, unless you desire to dry some of the cloves to be powdered later in a coffee grinder, then to be used as a sprinkle on favorite dishes.